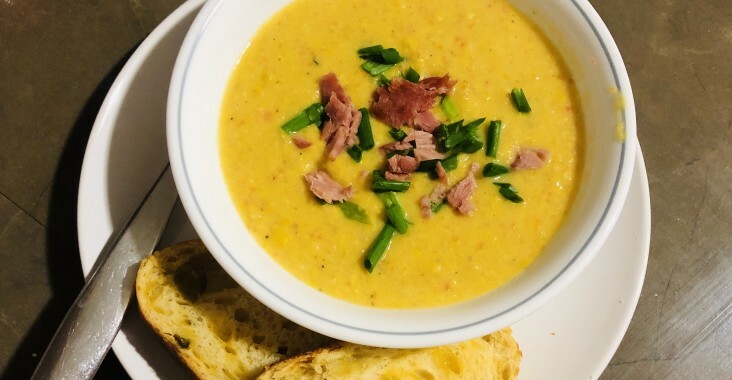 In keeping with our recent theme of Southern-style cooking, we had a hankering to try our hand at some tasty corn chowder. We had to exploit the last vestiges of winter and do some cold-weather cooking and make some warm, hearty soup. Place a large stockpot and melt butter over medium heat. Add in carrots and potatoes, and sauté until soft. Add in garlic and cook until fragrant. Add in corn and cook for 10 minutes, stirring often. Pour in the chicken stock and stir to combine. Bring to a boil, then reduce to a simmer and continue to cook for 20 minutes. Season the chowder with salt, pepper and Cajun seasoning. Remove from heat, and, using an immersion blender, partially (or completely) blend soup. Stir in the cream. Place pot on the stove and warm through. Adjust seasoning to taste. Serve with bacon and chives as garnish. Super tasty! The chowder had a lovely sweetness to it deriving from the natural sweetness of the corn. We used turkey bacon, which, while not as strong as pork bacon, still gave a nice salty counterpoint to the sweetness. We wanted to still have some chunks of corn, so we only partially blended the soup. Ultimately, though, we could have probably blended it even more, even to be completely smooth. S commented that a bit more potato to thicken it even further would be nice, and perhaps the addition of some heat (hot peppers or spicy seasoning), maybe even some cheese too! The great thing about soups is the possibilities for finessing are endless. But this recipe provided a tasty solid base, a foundation for future tweaks. Yum!